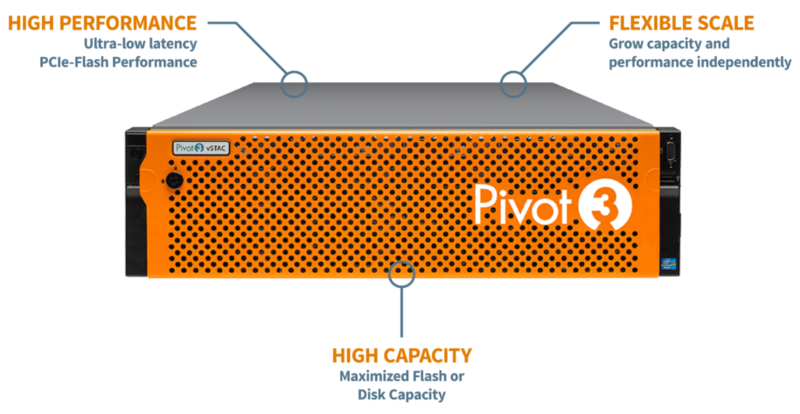 Pivot3 provides innovative all-flash and hybrid flash arrays that deliver predictable performance and better economics through an innovative architecture that leverages PCIe flash and advanced storage Quality of Service (QoS). Unlike other arrays that treat all data the same, Pivot3’s dynamic storage QoS governs performance targets, I/O prioritization and data placement, allowing you to meet Service Level Agreements (SLAs). Pivot3 flash arrays deliver the predictable application performance your end-users require, along with industry-leading performance, density and management simplicity. Manage via web and CLI, as well as converged management within VMware vCenter Server that simplifies storage management for virtualization administrators. In-depth performance metrics and analytics provide real-time intelligence for insight and decision making. All features are included at no additional cost, including data protection with integrated snapshot and replication. PCIe-flash integration means flash is closest to RAM and CPU on each storage processor for lowest latency performance. Our innovative multi-tier architecture is designed to encompass RAM, PCIe-flash, SSDs and HDDs storage tiers, as well as future media types, all managed by Storage QoS to deliver on your application SLAs. Align each workload’s performance to its business value with simple to apply, policy-based prioritization. Set targets that govern prioritization and automated data placement, all at a level of granularity that matches the dataset—either the LUN/datastore level or down to the individual VM/VMDK level. Three powerful data reduction technologies provides I/O reduction for a 2.5x performance, I/O consolidation for 4x flash endurance and inline data reduction for a 2:1 capacity reduction. Pivot3’s Dynamic QoS allows business to meet application SLAs with easy to manage policies that provision performance, prioritize workloads, and manage data placement and protection. With the ability to automate and schedule granular QoS settings, from a LUN/datastore level down to an individual VM/VMDK, Dynamic QoS significantly reduces the time it takes to manage performance and data protection. Businesses are looking to reduce CAPEX and OPEX by consolidating their server and storage infrastructure and running more applications on them. Flash arrays and hyperconverged infrastructure are rapidly becoming the solutions of choice as customers modernize their data centers. However, many are disappointed when they encounter inconsistent performance caused by resource contention, software overhead, controller bottlenecks, and other system constraints. 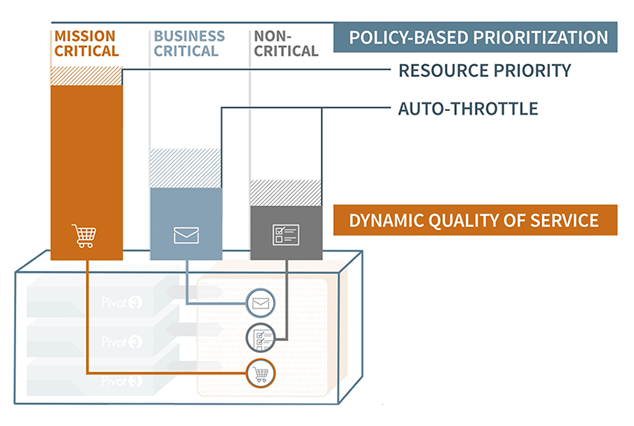 Most Quality of Service (QoS) features are not designed to address these issues, because they only set caps on performance, and are unable to prioritize I/O or data protection operations. Watch the video below to learn more about the benefits of Pivot3’s Dynamic QoS and HCI. What Makes Pivot3 QoS Dynamic? Each business workload is unique, which is why Pivot3 allows customers to assign an appropriate performance level to each one. QoS performance policies define performance targets for each workload that manage minimum IOPS and throughput, and maximum latency. QoS policies are assigned when a volume is created and can be changed on-the-fly as business needs require. By automating policy changes, QoS scheduling give IT the agility to support the business as application priorities and workloads change. Each QoS policy has a corresponding Service Level that automatically governs how each one is prioritized when the system is under load. There are three service levels built into the QoS engine: Mission-Critical, Business-Critical, and Non-Critical, and each is pre-assigned to QoS policy. They instruct the system on how important it is to maintain each QoS policy's targets. For example, if there's resource contention, QoS policy 1 (Mission-critical) will be maintained by prioritizing its I/O requests over Non-Critical workloads first, and Business-Critical workloads, if necessary. Dynamic QoS manages where data is stored in real-time (RAM, PCIe flash, SSD or HDD) to ensure performance Service Levels are met. The caching and tiering algorithms of the system are directly tied to the QoS policies and priorities in order to ensure that the right data is placed in the appropriate storage medium to deliver on the specified performance targets. The data is moved between tiers in real-time as workloads change, ensuring predictable performance and the most efficient use of system resources. Data protection QoS provides policy-based management and automation of snapshots, replication and retention to best align with data protection needs. 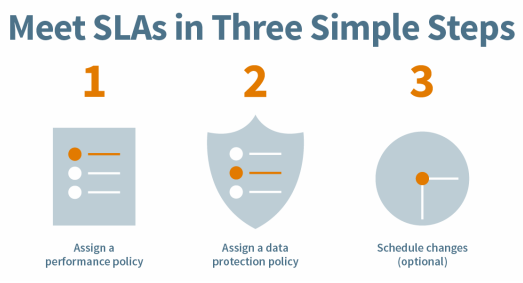 Policies can be applied to volumes or groups of volumes, and can be scheduled, allowing customers to set pre-defined schedules for both performance and data protection policies that can change automatically at pre-determined times. A queuing mechanism ensures that mission-critical jobs go to front of the queue to be executed first, business critical jobs next, and finally, non-critical jobs.